During the original WoW Source interview for Warlords of Draenor, it was mentioned that one of the concepts for Garrosh’ story after Mists of Pandaria was for him to take the technology he’d developed and create a Mongrel Horde, employing a bunch of the mook races like kobolds, troggs, and gnolls. Obviously this was thrown out in favor of resurrecting the old Blackhand Horde, but I felt like the concept warranted a bit of additional thought. Unused concept art for the Mongrel Horde. Courtesy of WoWpedia. The short version of why this concept dies on the table for me is because most of these mook races end up being low-ranking threats that players take out during very low-level play, and for the most part they don’t show up in higher-level zones. They get supplanted by threats like the Scourge, or the silithid, or trolls, and obviously all of the expansion threats that show up (which, admittedly, include upgraded versions of some, like snobolds and stone troggs). At its core, though, if you armor up a trogg or have a bunch of gnoll fusiliers or kobold sappers, they’re all still inherently less threatening than a horde of orcs and goblins in the same kit. The stupidity that’s commonly associated with all of these mongrel races is really the thing that deflates their menace. Now, one way you could work around this problem is if you introduced a change that made all of these races suddenly much more dangerous. And I think I might have a way to do that. Brann Bronzebeard theorized that many of the sentient races on Azeroth are descended from or highly associated with particular Ancients: the quillboar are associated with Agamaggan, the gnolls with a hyena Ancient, the kobolds with a rat Ancient. We know that some Ancients, again like Agamaggan, didn’t survive the War of the Ancients against the Burning Legion. So let’s go out on a limb here: let’s say that Brann is right, and that all of these Ancients were responsible for these races. But like Agamaggan, these races all lost their Ancient progenitor in the War of the Ancients, and their civilizations failed to thrive as a result. So the reason the quillboar, gnolls, kobolds and other mongrel races lack anything better than a low cunning is because they lack the guidance of their Ancients. Now, let’s say that someone approaches Garrosh with the idea of taking the gnolls, the quillboar, and the kobolds and making a fighting force out of them. Garrosh dismisses the idea out of hand for the same reason I did (i.e. “they’re all morons”) but this someone suggests resurrecting those Ancients in order to empower the mongrel races and giving them a reason to unify. This dude. With an army of angry boar-dudes. This has got a variety of effects to it. First, you’ve got a bunch of troops who have got a renewed reason to unify and fight, because now they’re fighting for their gods. 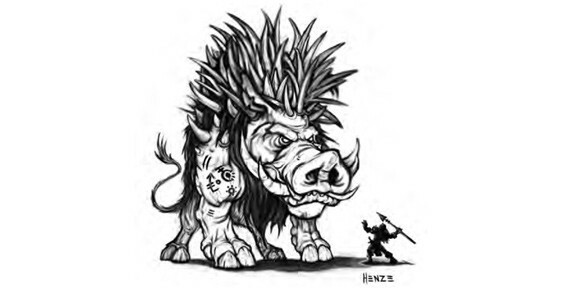 This is what quillboar society has always been centered around (they just haven’t really had the right numbers, and there was that problem with the Scourge messing up their base), and is exactly what the gnolls would need to actually become dangerous. Second, you’d have the Ancients themselves as potential weapons to throw on the battlefield; Agamaggan was a hero in the War of the Ancients, so if he was motivated to fight for Garrosh, he’d be a devastating opponent. The gnolls’ hyena Ancient is basically what happens if you cross Hogger’s menace with Goldrinn’s power, and if played right could be authentically scary. A rat Ancient doesn’t sound scary at face value, but then his minions tunnel through your walls and poison your water supply. Third, you can still play with Garrosh taking Blackfuse’s technology and deploying it with the mongrel troops. Maybe an orc with a machine gun is more physically imposing than a kobold with a machine gun, but it’s still a machine gun and it’ll still kill you. So instead of Garrosh and his time-travel shenanigans, you’d have the Mongrel Horde be an authentic threat, because not only have you got the legions of suddenly-superpowered mooks running around with new focus and direction, but you’ve got their gods as enemies too. Maybe it’s not an expansion-headlining threat, but it could certainly be on par with many of the other mutually-aggressive enemy factions in the game. This Post was posted in Factions, Hypotheticals and tagged agamaggan, garrosh hellscream, gnolls, kobolds, quillboar, really what if rat king from TMNT was a raid boss he'd mess you up. Bookmark the permalink. This is one of those things thats so fun about the WoW franchise. Theres a lot that can be done with the lore. It just feels like Blizz looks for the cheapest thrill to develop around – and then they dedicated the ENTIRE game to that thrill. I like how in vanilla there were a lot of things going on. It wasn’t all about Kel-thuzzad or Ragnaros. The story changed throughout the game. This was lost after the first expansion. There’s room for things like the Mongrel Horde. Just not if you use Blizzards approach of “only one thing is happening!”. Admittedly, I think that expansions need to be focused narratives. There’s room for flexibility in that (the troll dungeons in Cataclysm were a missed opportunity, for example, but Ragnaros in 4.2 and Lei Shen in 5.2 were good second-act bosses) but if I go in for an expansion I don’t want to be sold on the Scourge and then get space elves halfway through. I think the reason why there was such a spread of content in the pre-BC content patches was because they weren’t 100% certain how to go about doing an expansion, or they were tying up loose ends from the initial design that they didn’t have the resources to implement in 1.1. While that resulted in the sense of an expansive world with a variety of different threats, and while that plays into the concept of a World of Warcraft, I’m not 100% sold that this would work in a self-contained expansion-oriented business model. Now, there’s something to be said for another kind of business model, but I think I’ll save that for another post. I see what you mean bout having focused expansions, but I think they can be a lot less rigid than that. Having an expansion theme is one thing, but having every single thing you do in the expansion be about the same story every time is boring and superficial and …just doesn’t feel interesting at all. Part of the MMO experience, a large part, is the world. And I think for worlds to feel immersive they have to be capable of changing, shifting with the wind, and a lot of *different* things need to be going on. Some of those things even need to be of equal importance while being completely unrelated. I think Blizzard has said in the past that some work for the expansions were already underway when vanilla was released. I think what happened was they got in over their heads with all the millions they attracted and they *needed* to pare down the stories in order to get the product out. ANd with their glacial development cycles, all they know how to do is laser focus on singular stories. An insightful and well laid out post, I did love the Mongrel Horde concept due to my affection for the mob species and this was well thought out!